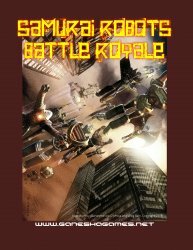 Samurai Robots Battle Royale is a stand-alone set of miniatures rules for mecha battles. Based on the award-winning Song of Blades engine, it allows to refight the wild, imaginative battles seen in the classic Japanese anime series. It also includes rules and guidelines for more realistic science-fiction military games, or even battles with steam-powered engines of destruction. You can play quick mecha vs mecha duels, or larger battles where each player controls 3-6 giant robots for a two-hour game. Written by Andrea Sfiligoi, illustrations by Giandomenico D’Amoja, cover by Giandomenico D’Amoja and Greg Bain.